Winter will be here before we know it here in Big Bear Lake, and the snow will be flying! You still have a little time to enjoy the beauty of fall though, and now you can do it with special discounts on top of our already lower, fall pricing. Come on up! It’s gorgeous up here!! Stay 2 Nights and get 10% off rent! Stay 3 Nights and get 20% off rent!! Good on NEW reservations only. Must book and stay between 10/28/15 and 11/15/15 and cannot be combined with any other offer. Other restrictions may apply. Head over to RSVacations.net and book now before these deals are gone!! We are expecting our first real taste of fall-like weather in Big Bear Lake this coming weekend with a storm expected for Sunday and Monday that could just bring the first dusting of snow to our mountaintops. Don’t worry though, Saturday looks to be a nice day to enjoy everything Big Bear has to offer! 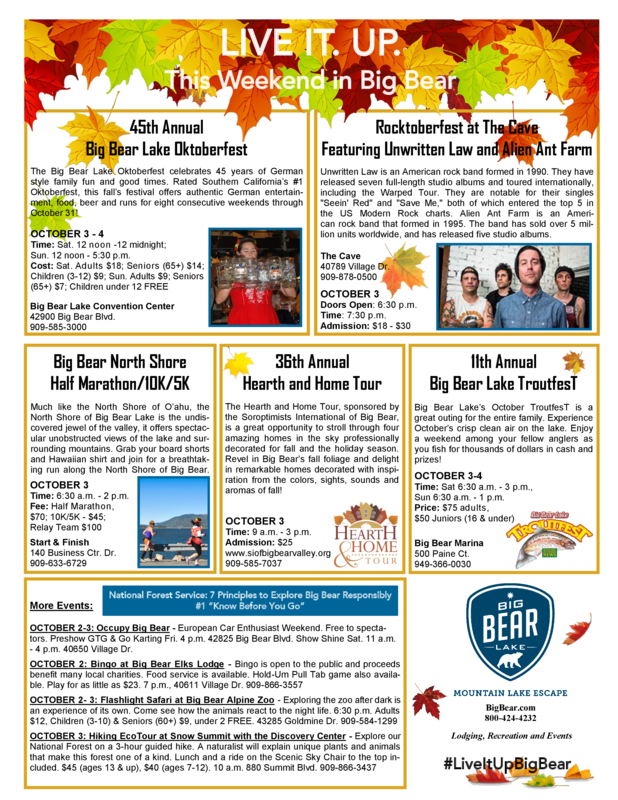 This is the ideal time to make a quick getaway to Big Bear to do some hiking, biking or to spend some time on the lake. Oh, and in case you haven’t heard, the best Oktoberfest in Southern California is going on through the end of October! The leaves are changing, the nights are cool and best of all, our cabin prices are at their lowest point of the year! Head over to RSVacations.net and find a clean and comfy cabin. Whether you are looking for a romantic getaway for two or getting together with a group of friends and family, we have a cabin to suit your needs and budget. If you are planning to join us for the Christmas or New Years Holidays, be sure to make a reservation soon because homes are going fast! Book your Big Bear Cabin today!